What is lawn aeration? When and how to do it? If you are a novice or seasoned gardener, or simply a homeowner who has an interest in understanding and knowing more about landscaping, you may have heard of lawn aeration even if you have little idea of what it is. 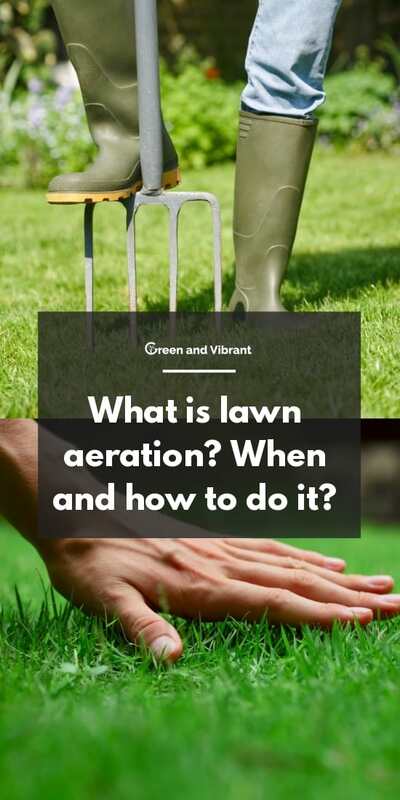 In this article, we will provide an in-depth explanation of what lawn aeration is, why & when you should do it, and provide tips that will help you with the actual process. What exactly is Lawn Aeration? The main purpose of lawn aeration is to provide air and breathability to your lawn and the soil underneath it. During the process of aeration, the soil is punctured with small holes that aid vital elements, such as air and water, to enter the grassroots. This process helps the roots to grow deeply, which in turn produces a stronger and livelier lawn. It is important to aerate your lawn because it helps to alleviate soil compaction. When the soils are compacted, they have a dense particle population, and this prevents the air, nutrients, and water in the soil from properly circulating. Excess lawn thatch, which is a layer of living and dead turfgrass tissue that has amassed on a lawn surrounding the base of the grass, can also starve the roots from the vital elements. Thatch is comprised of shoots, stems, and roots. This built-up plant material, also referred to as organic debris, is beneficial to the overall health of the lawn, but too much of it can deter healthy lawn growth. A half inch or more of lawn thatch is considered too thick and should be removed since it can also promote insect manifestation and diseases. Furthermore, excess thatch can prevent you from mowing your grass properly because its spongy consistency causes the lawn mower wheels to sink down and scalp your lawn. Overall, if your lawn does not appear to be growing as well as it should despite seemingly proper care, such as adequate watering, lawn aeration might be the missing key element. Here are some other indicators that you should aerate. Your lawn was established as part of a recently constructed house. Usually, the topsoil of newly constructed lawns is buried or stripped, and the grass established on sub-soil is compacted due to construction traffic. If your lawn feels supple and gets dehydrated quickly, it is more than likely that excessive thatch is present. Measure the thatch, and if it is over a half an inch, aeration is recommended. Your lawn was created by turf, and soil layering exists. Soil layering is when a thin layer of garden compost is spread over the top of the bed in order to grow seeds. This layering disrupts water drainage, which then leads to compacted conditions and poor root development. The process of aeration will break up the layering, thus allowing water to flow through the soil more easily and get through the roots. If your lawn has heavy traffic, such as children and pets playing and running around the yard, aeration would be beneficial since frequent traction contributes to soil compaction. The ideal time to aerate your lawn is during weather periods that will support its recovery. The optimal times for this to happen are during growing seasons, and this is dependent upon the type of grass. Cool-season grass tends to thrive during the cooler temperatures of the spring and fall, whereas warm-season grass usually thrives during the early summer months. Lawn aeration is best performed at these times because weather during these periods helps to control lawn thatch. It is not necessary to aerate every year if your lawn is healthy and growing well or if you have sandy soil because it does not compact easily. In these cases, aerating every 2-3 years will suffice. When this process is performed more than necessary, it can damage your grass and the subtle balance between growth and dormancy. On the other hand, it is best to aerate every year if you have a heavy traffic lawn or clay soil, which is wet, sticky, and compacts easily. Additionally, lawn aeration is recommended twice a year if you live in harsh climates and/or experience particularly cold, dry winters. Lawn Aeration can be completed with either a manual tool, which is operated standing up or a power tool. First, let us discuss the types of manual tools that can be used for the process. The two main types are a spike lawn aerator and a plug aerator. A spike lawn aerator is a garden tool designed to assist you in creating small holes into the ground with a solid tine. A plug aerator (or core aerator) removes a core or plug of grass and soil from the lawn. It executes the process through spikes that consist of hollow cylinders. This creates deeper holes than a spike lawn aerator. But it tends to need more labor and does not have as much coverage as a spike lawn one. Manual aerators are effective, but they can be labor intensive if your lawn is considerably vast. A power aerator is a commercial tool that is ideal for those who have a vast lawn. If cost is a deciding factor, keep in mind that power aerators are more expensive than manual ones. Additionally, if you decide on a power aerator, we recommend that you purchase a coring model. If your grass is more prone to compacting and lawn thatch, it is best to use an aerating tool or machine that removes plugs of soil as opposed to a tool that simply pokes small holes into the ground. The actual removal of plugs of soil is more likely to produce optimal results since the method of poking holes can actually add to the pressure and lead to additional compaction in the areas surrounding the holes. This happens because it does not remove the matter to create extra space. Adding to that, be sure to look for an aerating tool that removes soil plugs about 2-3 inches deep, 0.5-0.75 inches in diameter, and approximately 2-3 inches apart. For starters, here are few helpful tips to remember before beginning the aeration process. Do not aerate during a period of drought. Doing so will leave the roots of your lawn open to excessive sun exposure, which will produce the opposite effect of what you are working to achieve. Always water the lawn thoroughly a day or two before you plan to aerate so that the soil gets soft and moist. Naturally, if sufficient rainfall presents itself before you plan to aerate, it is not necessary to water the lawn. Be mindful of any irrigation pipes, sprinkler lines, septic, or utility lines so that you do not run over them and potentially damage the lawn. It is not cheap to repair them. Now let us discuss the steps for proper lawn aeration. Mow your lawn before aerating it. Be sure to go over the most compacted areas several times since most aeration machines only cover a small percentage of soil-surface per pass. It is ok to leave unaffected areas alone. 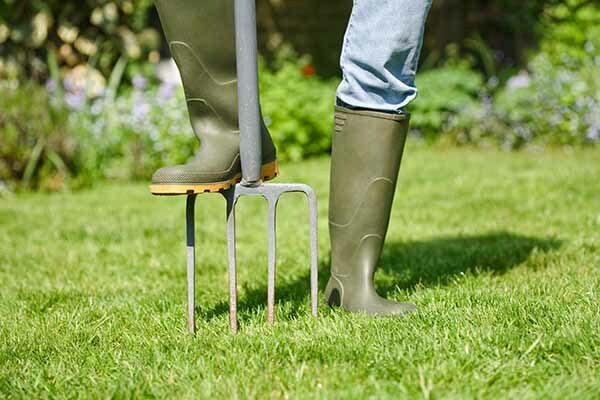 For soil that is softly compacted, you should aerate your entire lawn more than once. If you have never aerated your soil before or it is seriously compacted, go over the entire lawn twice. The second pass should be perpendicular to the first. Leave the plugs of soil, which were removed by the aerator, on the lawn so they can break down. Once the the steps abovee is complete, it is important to water the lawn well. Apply lawn food to provide the nutrients needed to help the lawn recover. Water the newly aerated lawn every 2-3 days throughout the next couple of weeks. Keeping it moist will ensure that germination takes place. After the entire aeration process is complete, the next step is to cover the aerated lawn with topsoil. Ideally, it should be screened topsoil that has been mixed with compost. Spread the topsoil to create a layer that is approximately ½ an inch thick. Then sew your seeds, either by hand, using expansive sweeping movements, or by using a spreader. If you use a spreader, apply half of the seeds first and then go back over all areas to be reseeded and spread in a different direction. Settle the seeds and then roll the lawn. Note: If your soil is full of clay, remove the cores or plugs and top dress the lawn instead. 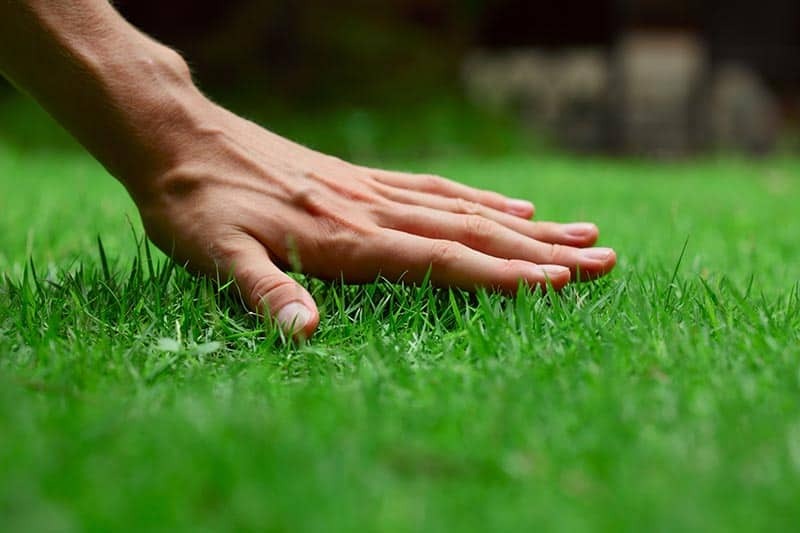 Now let us touch on some of the frequently asked questions about lawn aeration. How long does the aeration process take? It can take as little as two hours to aerate depending on the size of your lawn, but the plugs normally break down themselves in approximately two weeks. Be sure never to remove the plugs prematurely since this minimizes the effectiveness of aeration. Can I mow after aeration? It is best not to mow the lawn for at least one week after aerating it or until it has grown at least three inches tall. Should I fertilize after aerating my lawn? We recommend that you overseed, use fertilizer, and water the lawn within 48 hours after lawn aeration. The seeds, fertilizer, and water have the best chance of getting deep into the holes created by the aerator if applied shortly after aeration. The ideal time is the same as the best time for seeding a new lawn; and that is early fall. Does lawn aeration destroy pre-emergent herbicide on the lawn? No, it will not affect weed prevention or crabgrass control. Now that we have covered in detail what the process of lawn aeration is and why you should aerate your lawn, it is fairly safe to conclude that this process should be considered a very key component to the growth and health of your lawn. Furthermore, understanding the best times to aerate in order to attain the most favorable results, the tools needed to carry out the process, and how to safely and properly execute are all important things for gardeners, homeowners, and landscapers to know. Let us know your thoughts about this article and feel free to share it with others if you liked it and found it useful.